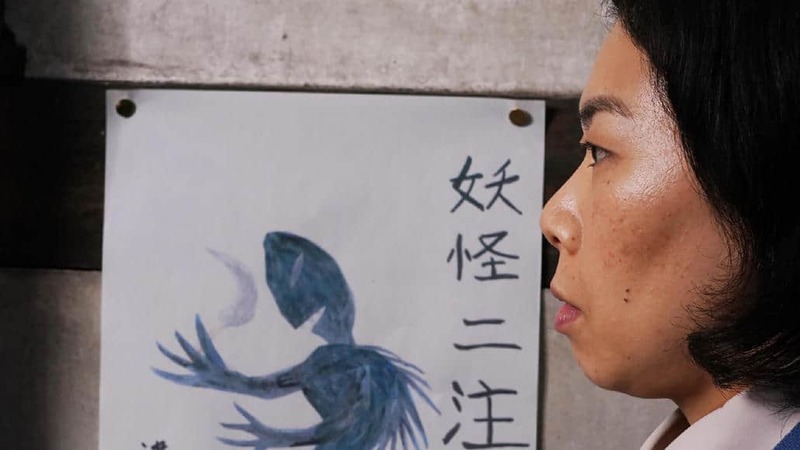 A regular at the IFFR where he previously won a Hivos Tiger Award with his film “Anatomy of a Paper Clip” (2014), and last year presented “Ambiguous Places”, director Ikeda Akira returns to the International Film Festival Rotterdam with his latest work, “The Monster and The Woman”. Ikeda crafts his films with care and patience, like a skillful artisan, taking his time from one and the other, raising all the money on his own and obsessively searching for the right actors. His new work is a short, 30min film, in tune with the quirky style of his previous ones and his theatrical experience emerges in “The Monster and The Woman” which could easily be a theatre piece and whose shots are beautifully and symmetrically framed. The Town Hall of a small town is the main set of the film. As the interface of a rigid bureaucracy, a woman and her robotic colleagues stamp away paperwork and documents in an alienating routine. But something is rattling the sleepy town; a monster is on the run and nobody knows how to deal with it. Voices about the monster’s ferocity and savagery start circulating and getting bigger and louder, helped by the ineffective police force and a dishonest Mayor. But not everybody believes the hype; the woman is more curious then frightened and wants to reach out. Using his familiar automata-style characters and their long stares and pauses, this time the director wants to tell us a story about xenophobia and integration and the dynamics that trigger and fuel our fear of the “aliens”; deception and lies, but mainly fear of disrupting the established order of things. It is a painfully topical subject and Ikeda faces it brilliantly with his deadpan sense of humour and the charming introduction of the power of art and music in the shape of a Shamisen (a traditional Japanese 3-stringed instrument) whose notes spell out Love and Hope in the bitter-sweet ending.